Just comment TODAY on any of our Overflow social media sites with your favorite Christmas movie for one entry and share the giveaway post you find there for three more chances to win! Each friend you tag will also give you extra entries!! Have fun!! Don’t forget the FREE Overflow Christmas Party for singlemoms and their sweet kiddos is December 10th at 4-5:30 at 1400 Brittmore! Register at overflowbcf.com. We can’t wait to celebrate with you and your family! 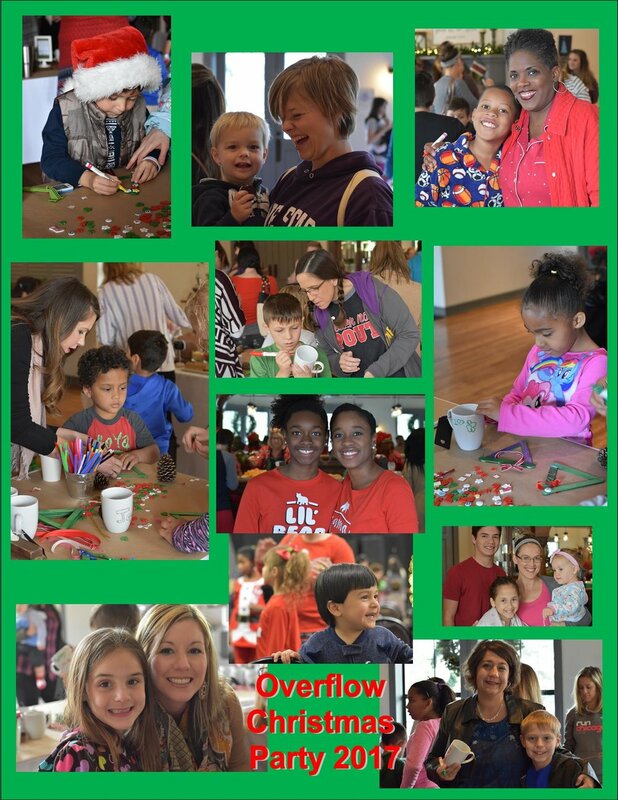 Overflow Christmas Party Details - JOIN US!!! We are so excited to let you know that the Overflow Christmas party is almost here! We have a fun-filled afternoon planned for you and your kiddos to get into the Christmas spirit. The party is on December 10, 2017 from 4-5:30pm at our future Spring Branch campus. It is located at 1400 Brittmoore Road. We have an afternoon of festivities planned. There will be cookie decorating, crafts, food, fellowship, and fun. (and probably a few surprises with goodies thrown in because we like surprises!) We hope to see all of you there! Come join us and help us kick off the Christmas season with your Overflow family! We miss seeing you guys and would love to spend the afternoon with you! Please register on the link below so that we can make sure we have enough food and supplies for you and your children. Come dressed in your most festive comfortable clothes! Ugly Christmas sweaters, fun festive outfits, even jingle bells work! Be creative and we will see you soon! On my Facebook memories today, there was a post from 2013 that I wrote while I was a single woman and mother to an outstanding, beautiful little girl. It was self-preaching, without a doubt. 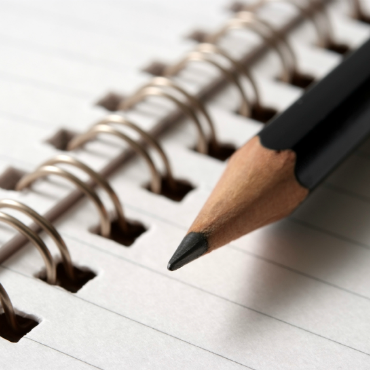 You’ll read that I was finishing out a year that I’d vowed to not allow the thought of dating into my mental space. I tabled the conversation so the Lord could heal the places in me that just wanted a man to come along and be a good companion so badly. I wanted to get to a place where I was okay if I never married. I wanted to understand the promises of God in a way that I could testify to the hope they bring. I wanted to be able to teach my daughter through my own life what it is to delight yourself in the Lord. I wanted her to see me pursuing the Kingdom of God and His righteousness and that “all else being added to me” didn’t have to look like what my small imagination might choose to ask for. I’d been discouraged, and after the simple act of laying down the idol of marriage, I was able to pick up a Reality that remains part of the fabric of His robe that I hold closest to my heart. Take heart. The One who loved you first, and loves you best, is waiting to show you what He thinks of you. Take time to delight yourself in Him and learn His heart for you. Allow the Truth to resonate in your heart, soul, body and mind that you are valued beyond earthly measure, cherished with highest sentiment, pursued with passion, wildly wanted, esteemed with joy, thought about, admired – and trust me – it’s no secret, rejoiced over, desired in conversation, craved in the sweetest soul-to-soul intimacy, sustained in grace, forgiven in full, intentionally observed, prayed for, and relentlessly and faithfully loved. Jesus doesn’t love you in secret. He is not fickle about you. Society, and the enemy (if the two can be separated), would love to see women, single and married, live in this cyclic relational lifestyle of manipulating and using our own devices to try, in vain, to draw out the kind of love that cannot be forced, coerced or even produced through one’s will. We were made for a fulfilling mutual relationship that is metaphysically intimate, with the Love that holds all power in safety, beyond the fibers of our being. He already put His whole life and body into making it work. Read this the right way, but I’m fully convinced Jesus saved women from “the curse of Eve”, the longing for our husband, with the sweetness of restoration in relationship with Himself. He is not a place holder or a substitute, but the King you’ve been over-actively searching and pining for. Take a breath. Rest in this. When I speak on my own singleness, I’m pretty sure people think my next move will be packing my bags for the nunnery. But this is real life stuff. And that could and would never happen. (Although, I just mentally saw a scene from Sister Act with me singing with Whoopie and liked it.) I just closed a chapter of a full year of intentional singleness and what the Lord revealed in my own heart was appalling, grievous, and relatively typical. God did not create us to long for men in a way that satisfies us, nor did he create us to manipulate and satisfy men. Set your batting eyes and let Love calm that sway in your hips, sister. Those are your brothers-in-Christ, your future brothers-in-Christ, or statistically, other peoples’ future husbands. If we are called to marriage, we were created to be one with our spouses in Him, in holiness and righteousness and under his anointing and authority (1 Corinthians 11:8-12). Men are good. We were made to coexist with men in healthy relationships, with one set apart for the distinct honor of marriage. Don’t make the mistake of playing house with a man who is not your husband. Pray hard. Wait steady. Live in the fullness of God always. Do some vetting so that you can trust the integrity of the man who you’ll settle your bones next to. King Solomon wrote, “do not awaken love before it so desires.” In other words: don’t let your mind fool your heart that something is what it was never meant to be. Even in marriage, “your man”, my man, whoever he is - isn’t the answer. Not in your parenting, finances, desires, temptations, struggles, longing. Jesus is the answer. He always has to be the answer, or you will always face disappointment. Submit yourself to Him. He's trustworthy. And crazy about you. In Christ, you don’t belong to yourself. You’ve been bought with a price and placed in a Family where you are ultimately protected as sacred. Sister, take a deep breath – and maybe take a break. Seriously. Enjoy singlehood. Surround yourself with healthy people. Live in the restoring promises that bring things to earth as they are in heaven. Don’t miss the relationship that will satisfy you, where you are shamelessly seen, known in full, and loved like crazy. What do you love to do? Learn what you were made to do. I don’t say this in a feminist way, or against men, but sister, learn to live in the freedom you have in Christ, start working in the way you’re wired to work, and love the way you were designed to love and be loved. Four years later, and I’m married now. I cannot tell you how critical it is to know that my husband is not my savior. He is not “my everything”, nor is he my heartbeat. All those things sound cute in Hallmark cards and memes, but they’re codependent and broken. My husband is my companion, but God knows me better than Anthony ever will. My husband is my best friend on earth, but he is not the best friend I have. Let me tell you something: I’m crazy about my man, and I’m sure I’m a more emotionally balanced wife because God walked me through this process. In my adult life, there have not been sweeter days than the ones I spent in my singleness, allowing the Lord to be my Everything. My expectations are safe with Jesus, because he always exceeds them. I have faced fracturing disappointments and gut-wrenching pain in my life, but I have found that as I bring the remnants and after-effects to the God who made me, He has the power and tendency to repurpose and make all things new. Sister, my heart is so with you and I pray that if you’re experiencing a lifestyle of loneliness today, you’d be met on your road of disappointment with the Truth that you are seen, you are ADORED, and that God is fully prepared to meet you where you are. There are not too many tears for Him to capture; He sheds them with you and for you. You are not “too far gone” for Him to reach you. Lately, I’ve had several nights where I woke up around 4:30 or 5 am and could not go back to sleep. I tried all the things to get back to sleep – flipping my pillow, lavender essential oil, praying – but still I lay struggling to sleep. I knew the day coming would be rough if I didn’t have the rest I needed. So, I tossed and turned to, finally, fall asleep as daylight broke through to a new morning. 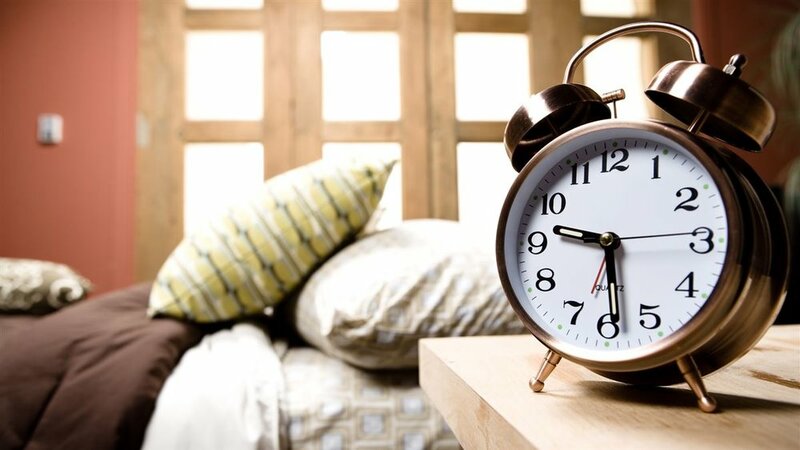 Now, I was starting the day confused on why I was having trouble sleeping well and frustrated that I had once again slept too late. Immediately, the phrase “the Spirit” leapt out at me. I read again and again in a meditative way asking the Lord to amplify and illuminate his word for me. The Lord is the Spirit. Jesus, God and the Holy Spirit are one and to follow the Holy Spirit is to follow Jesus. While pondering these things, the Lord gently reminded me that I had recently been asking him to wake me earlier and help me to be more intentional with my mornings. To have the time and preparation in the morning for time with Him and the tasks that needed to be done. I have been unhappy with my lack of self-discipline and knew that it was beyond me to fix this in me. I had asked him to guide me, equip me, wake me and inspire me towards a new start each day. What if this had been the Holy Spirit waking me in the very early morning? Granted, I had not thought of a wakeup call from the divine One. I just wanted to get up when my alarm went off! But what if I was not struggling against insomnia, but against the Living Spirit of God? What if He was answering my prayers, just not in the way I had planned? What if he had blessing waiting for me, but I fought for sleep? What if true rest would have been found in following the leading of the Spirit? Did I want freedom from my own weak efforts to change or did I want freedom? Freedom from sin. Freedom from shame. Freedom from repercussions. Freedom from expectations. Freedom to not be better, do better, look better, but instead to be in the Spirit and follow where He leads – there lies freedom. Freedom for me and freedom for you, beloved of the Lord. I can remember year after year watching my Dad hoping that they would make the playoffs, and year after year it just never happened. They got close a time or two, even made the World Series in 2005, but the dream never became a reality…until this year. My Dad in his high school baseball days! 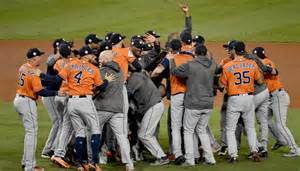 The minute that final out was called on Wednesday night the tears started flowing for so many Houstonians. Some that were baseball fans and some that were just caught up in the excitement of it all. I called my Dad after they won and he couldn’t even contain his emotion. His dreams had finally come true. My mom said that all he kept saying was, “I am so glad I was still here to see this!” Years of hopes and dreams finally coming to fruition for a true fan! It was just too much to contain his excitement and emotion. We have all heard the players say that they played and won for all of us. They won for the fans of over 50 years, they won for the fans that just found them, and they won for the victims of Hurricane Harvey. They fought and won so that this city could breathe again and smile again and be reminded that we are all in this together. What struck me most as I watched our Hometown Heroes in the victory parade was the bus that drove by carrying Cruz, Biggio, and Bagwell. Their Astro careers have long been over, but yet there they were in the World Champion parade with the biggest smiles on their faces. I bet if you asked them they would have told you they felt like they were part of the 2017 team. They would have said that their dreams had come true. Because you see that is how creative and how big our God is. He doesn’t leave us in our present condition. He doesn’t ignore our hopes and dreams. He is always working things out for our good. He may not have answered the dreams you have right now, but He has heard your prayers. He leaves no stone unturned. It may not be in your timing or it may not look exactly like what you think it will, but He is faithful. Just go ask the Houston Astros of the 1980’s and 1990’s that got to ride in a victory parade. They didn’t have to be included, but somehow God worked it out and got them there. Go ask my Dad who probably will tear up the minute you mention his beloved Astros! He never thought he would be here to see it, but he is! God is faithful yesterday, today, and tomorrow. Our God is an all-inclusive God! He invites all of us to the table, to the celebration. We all have a seat waiting for us at the feast with Him. He is just asking us to have faith and believe and trust Him and His timing! I am willing to trust Him with all of my hopes and dreams, are you? 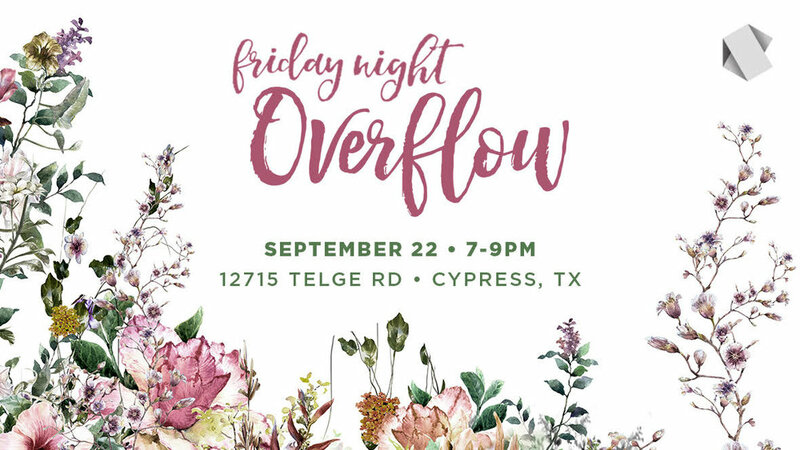 We are so excited to let you all know that we are gathering for Friday Night Overflow on September 22, 2017 from 7-9pm! We would love to have you as our guest and be able to see your faces and hug your necks! We have a special treat for you in our guest speaker, Barbara Stuart. Today we wanted to give you a chance to get to know her, and let you know how excited we are that she is willing to share her heart and her wisdom with our Overflow community! Barbara has raised two sons and a daughter as a single mom here in Houston. You may know one of her sons as the long time leader of Breakaway Ministries, Ben Stuart. All three of her children are now grown and married with children of their own. They have all left Texas for a spell in their current life situations, and she enjoys traveling from Alaska to the East Coast in order to keep up with everyone as often as she can. She is the delighted grandmother of 8 beautiful grandchildren ranging in age from 2-10 years old. While being a single mom, she was also an educator here in the Houston area. She spent more than 2 decades teaching high school students. She has taught pregnant and parenting students through the drop out reduction program that Katy ISD offers. After retiring from teaching, she has spent the last 7 years as a sorority House Mom in College Station. She recently retired again, but is not finished working and traveling to keep up with family and friends. We think she is the perfect person to come and spend Friday night with us! Her background and knowledge can help all of us grow as mom's and as women. We hope that you will join us next Friday. We will serve you dinner and childcare is available, but it must be reserved beforehand. Please feed your children dinner before you come. We will have light snacks for them and tons of fun, while you relax and enjoy your evening. We look forward to seeing each and every one of you! Click below to register and let us know you will be there!